Editor's Note: Akiyo Matsumoto, who is a native of Japan, translated this post into Japanese. 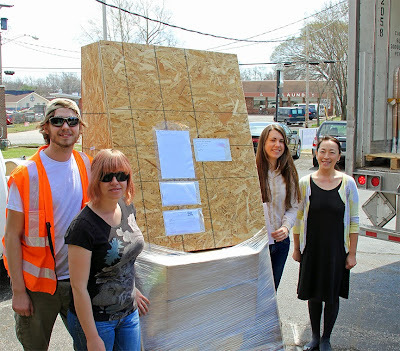 Three of us from Little River Research & Design are heading to Japan in a few days to attend the Japan Geoscience Union meeting. JPGU is a partner organization of the American Geophysical Union, and we have attended annual AGU meetings for several years. Akiyo, Anna and Meriam at our booth in San Francisco at AGU 2014. We are excited to be taking two of our models to Japan. We will have an Em2 and Emflume1 near Tokyo at the Makuhari Messe International Conference Hall in booth number 43 from May 24 to 28. Japan has a long history of river research, and many challenges with water-related geohazards, including flooding, landslides and tsunamis. Our Emriver models can further efforts to understand these hazards. Jim, Keisha, Anna and Akiyo see off the first Emriver Em2 geomodel to Japan. We are also excited to add two Japanese institutions to the list of our worldwide owners. Our Emflume1, Em2, Em3 and Em4 are facilitating river science education and research in Canada, Australia, nine countries in Europe, China, Taiwan, and 48 U.S. states. We are happy to add Japan to the list! We look forward to meeting new people at JPGU and continuing to send our models across the world to contribute to worldwide science education and research. Anna and Akiyo demonstrate a landslide in an Em2. 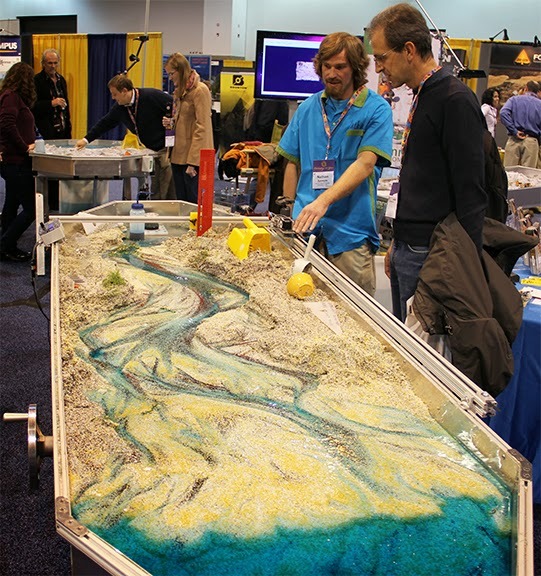 An Emriver Em3 geomodel at an event in Denver, Colorado in 2013.